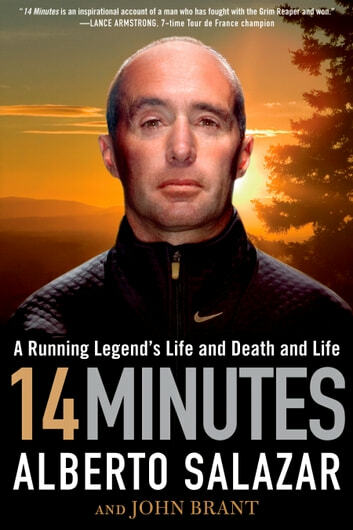 In 2007, after collapsing on a practice field at the Nike campus, champion marathoner Alberto Salazar's heart stopped beating for 14 minutes. Over the crucial moments that followed, rescuers administered CPR to feed oxygen to his brain and EMTs shocked his heart eight times with defibrillator paddles. He was clinically dead. But miraculously, Salazar was back at the Nike campus coaching his runners just nine days later. Salazar had faced death before, but he survived that and numerous other harrowing episodes thanks to his raw physical talent, maniacal training habits, and sheer will, as well as—he strongly believes—divine grace. In 14 Minutes, Salazar chronicles in spellbinding detail how a shy, skinny Cuban-American kid from the suburbs of Boston was transformed into the greatest marathon runner of his era. 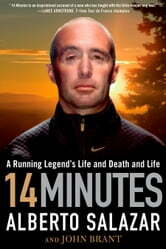 For the first time, he reveals his tempestuous relationship with his father, a former ally of Fidel Castro; his early running life in high school with the Greater Boston Track Club; his unhealthy obsession to train through pain; the dramatic wins in New York, Boston, and South Africa; and how surviving 14 minutes of death taught him to live again.